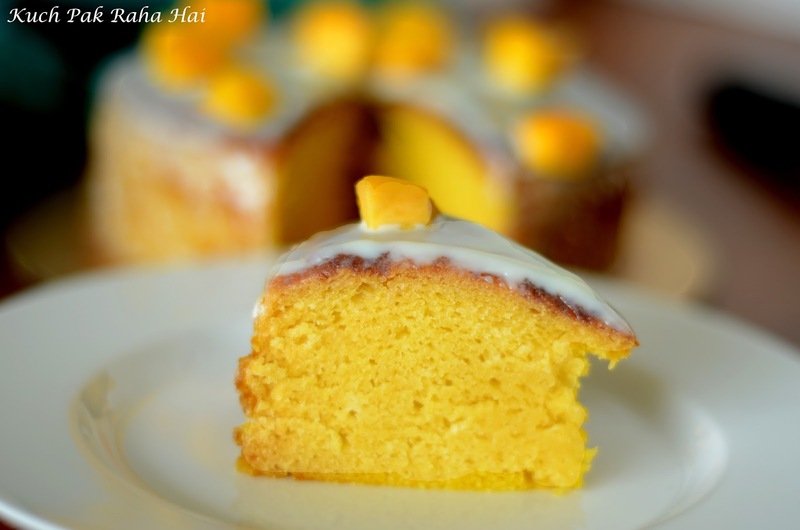 On the occasion of 2nd Blog Anniversary, I am going to share a lovely Eggless Mango Cake recipe. This post is special one. I still remember this day two years back when I was writing the first post on this blog, I was myself really unsure how things would turn out. Initial idea was just to compile a set of tried & tested recipes with some supporting images that would help the readers to understand and execute a recipe. Gradually, things started falling into places automatically. The first person who has encouraged me and supported me so much in this blog during these 2 years was my mom. She made sure she pushed me beyond the limits which I had set for myself. 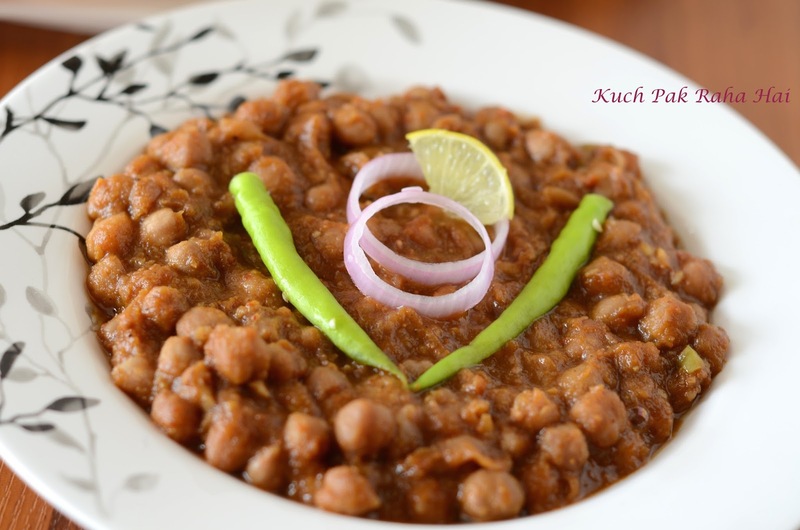 Without her, I don't know what I would have done as a food blogger. The other two persons who have been a part of this journey are my brother and husband. My brother has always been my honest critic which has really helped me in improvising my writing and designing skills. 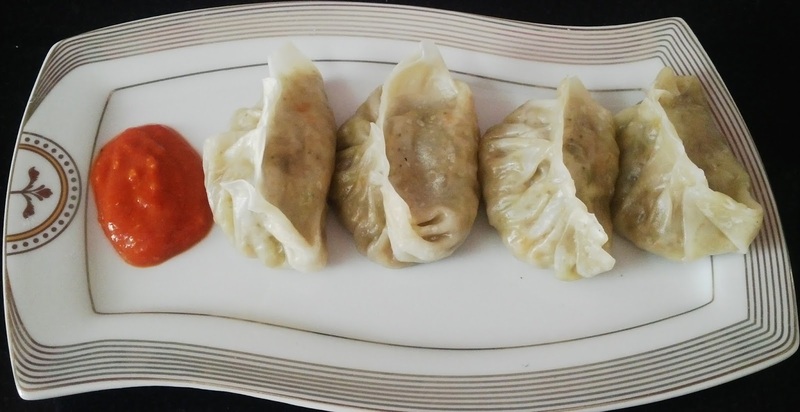 The person who really saw me grow in my journey of cooking is my husband. I had many ups and down during my trials for new recipes. Some were hit, some where flops but he made sure to bring a smile on my face even while eating those not-so-good dishes. I can't thank him enough for his patience and positivity. I have learned so much from him in photography. The journey of clicking pictures from a mobile phone to DSLR was possible just because of him. 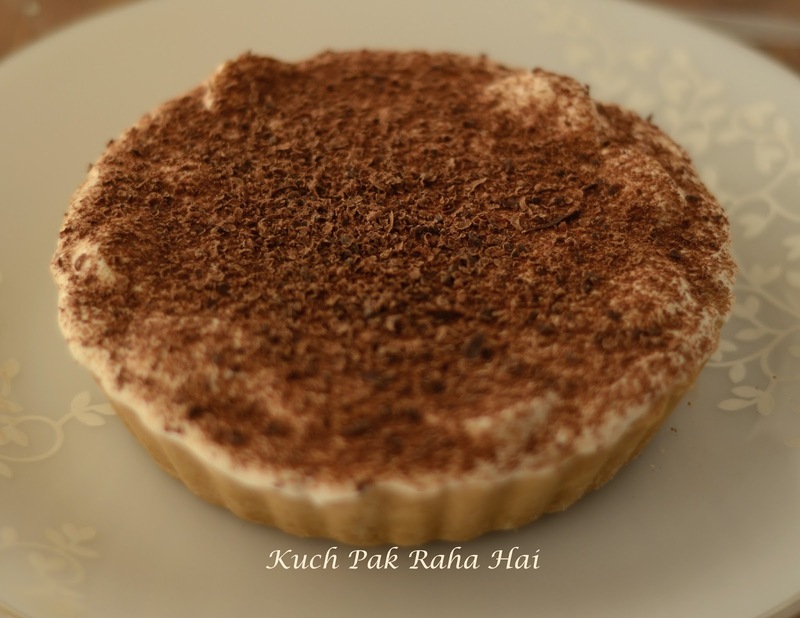 Last but not the least, to all the readers who send such beautiful comments and pictures of tried recipes, the mere thought of bringing a smile on someone's face really motivates me to even work harder and come up with new interesting recipes every time. 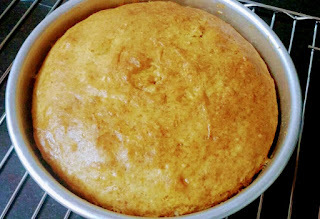 The Eggless Mango cake recipe which I am sharing today is really simple to make with the ingredients readily available at home. It is perfect cake for summers as it has just the right zing and flavour of mangoes. This cake tastes best when chilled and served with fresh mangoes. 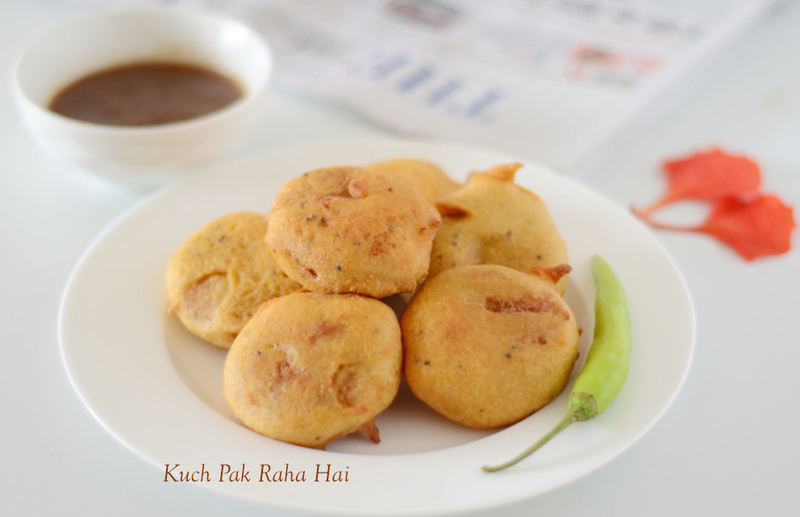 It is soft, spongy and delicious with hues of mango flavour in every bite. 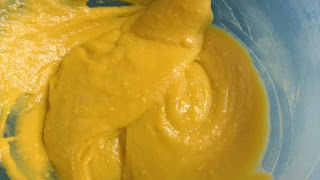 The colour of the cake also comes out really nice because of the fresh mango puree used. I have decorated the cake using white chocolate ganache and mango pieces. The garnishing is optional and you can skip it. 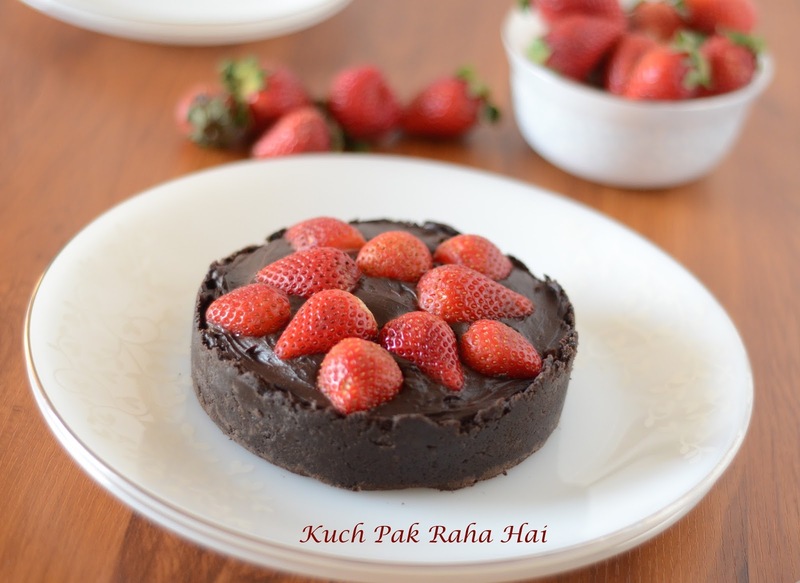 Other serving suggestions are to serve it with mango sauce, chocolate ganache, vanilla ice cream or have it simply as a tea time cake. I have used fresh mango pulp in it preparation. 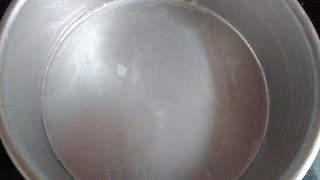 To enhance the aroma of mangoes, I have added a little bit of mango essence. If you are using tinned mango pulp, then no need to add essence. Adding food colour to the cake batter for more vibrant colour is up to your choice. 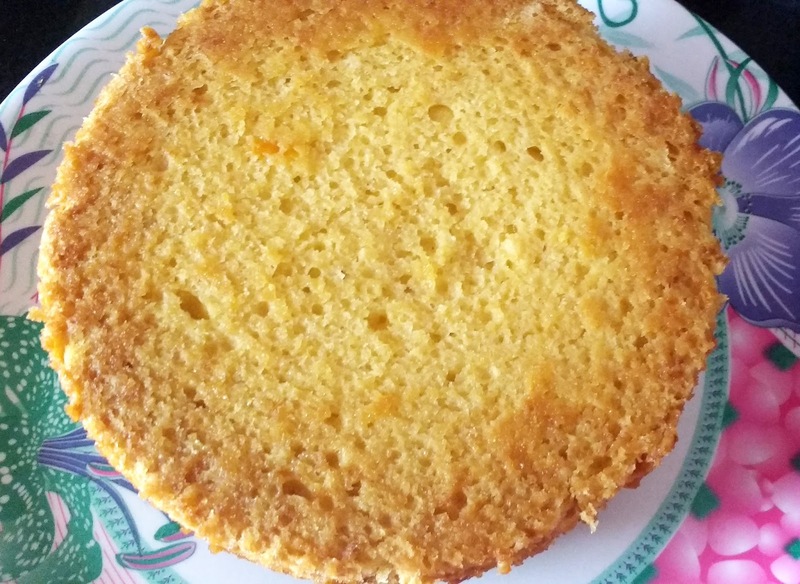 Hope you would like this yummy eggless mango cake recipe!! 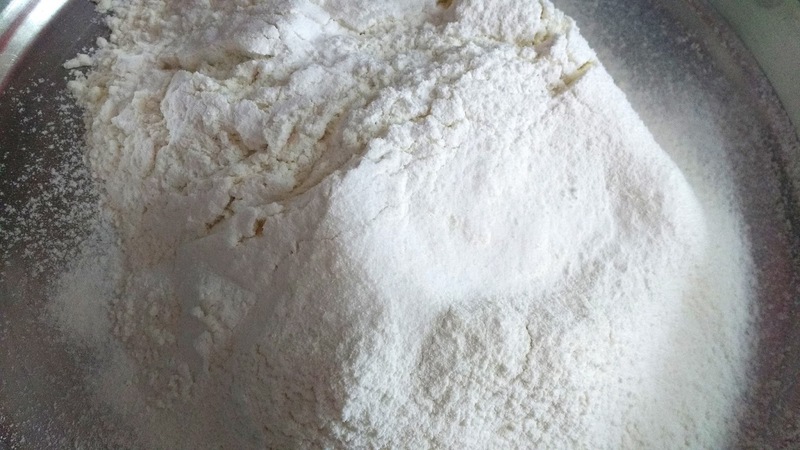 Sieve together all the dry ingredients-maida or all purpose flour, baking powder and baking soda. Keep them aside. Add sugar to the warm milk. Whisk till all the sugar is completely dissolved. Puree the fresh mangoes slices. 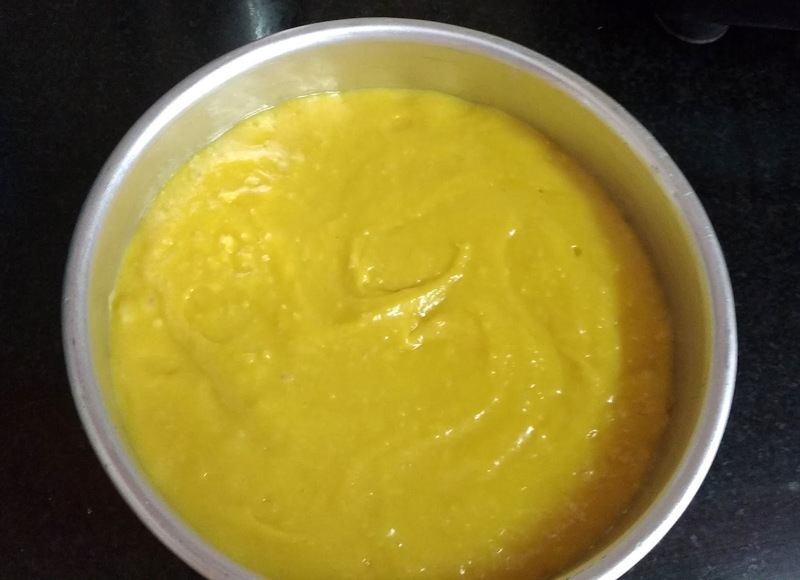 It takes almost one mango to gives 3/4th cup of puree. 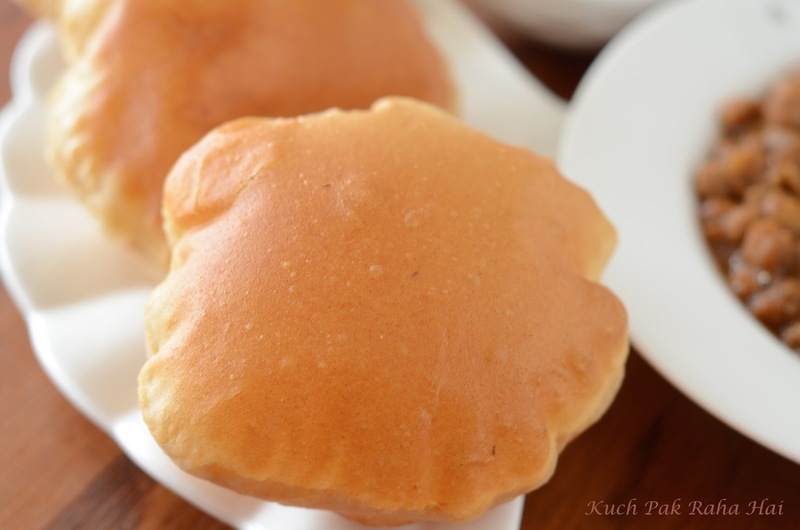 You can even use tinned mango pulp. 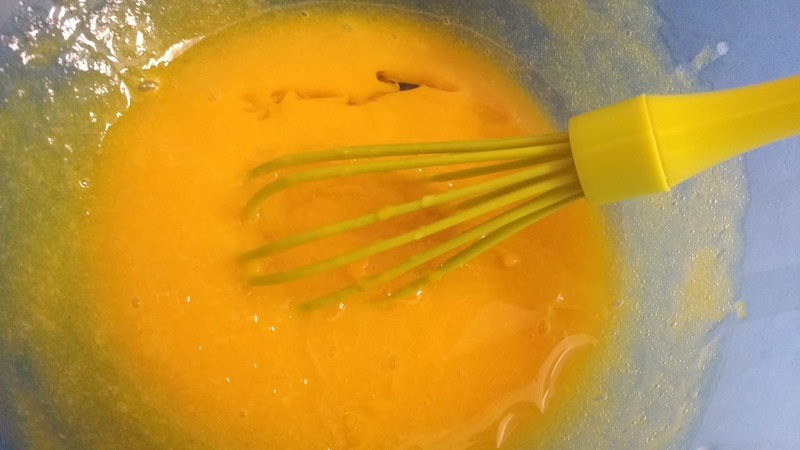 Add this mango puree and lemon juice to the whisked milk-sugar mixture. Mix well all the ingredients. Add oil to the above mixture to form a thick mixture. Please take care the oil should be tasteless and odourless. 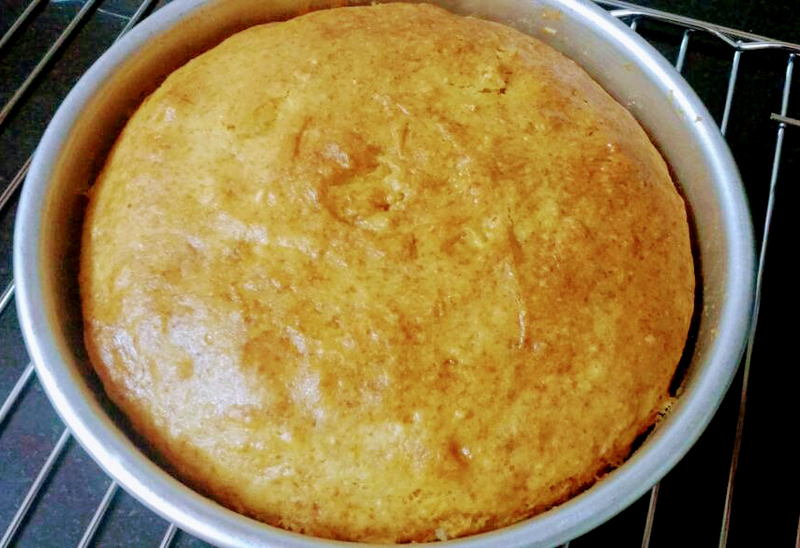 If the oil has smell of its own then it alters the overall aroma of the cake. Keep it aside. Set the oven for preheating at 170 degree Celsius. By the time it is preheating, line the cake tin with butter paper. Grease it using little bit of oil or butter. Add the sieved dry ingredients to the mixture prepared in step4. 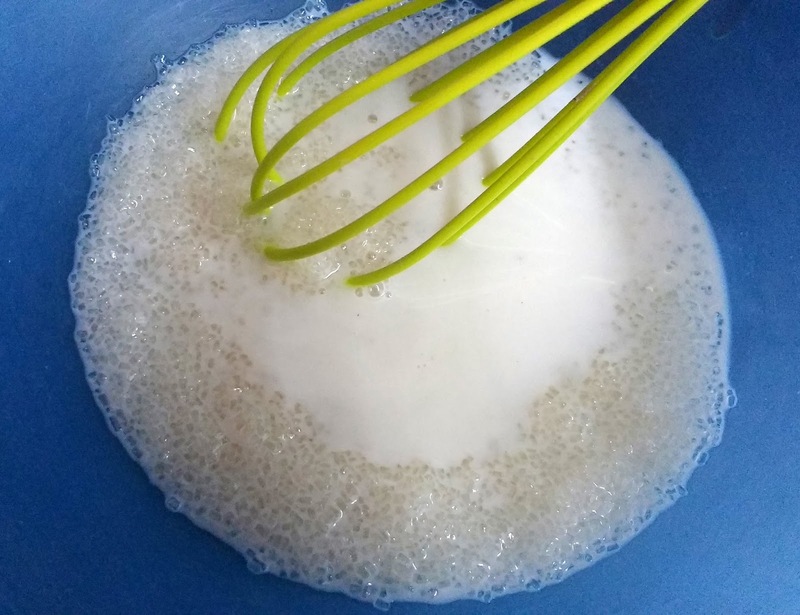 Fold the dry ingredients into wet ingredients gently using silicon spatula to give smooth thick batter. Transfer the cake batter in the greased cake tin. 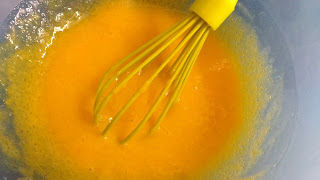 Tap it gently to even out the batter. If the oven has preheated by now, place the cake tin inside and let it bake for 170 degrees Celsius for 30 minutes. 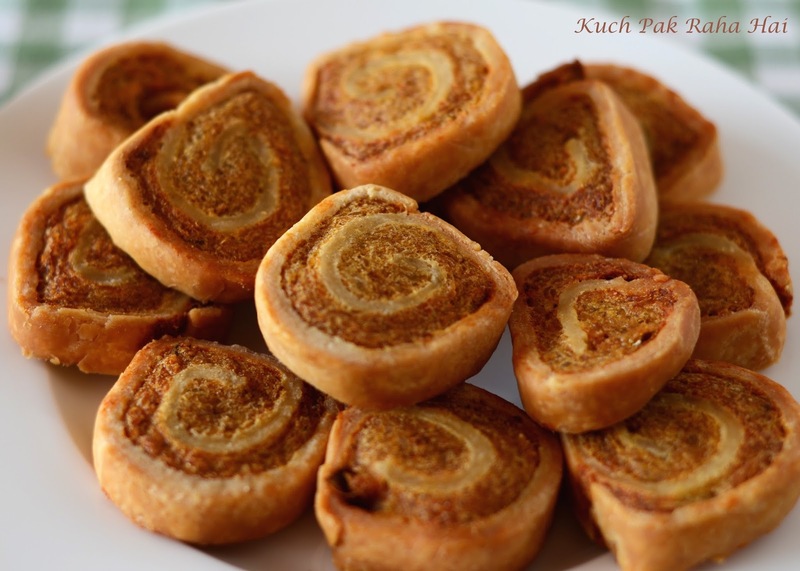 After 30 minutes, test its centre using a tooth pick or skewer. If it comes out clean, the cake is ready else bake for another 5 minutes. Once the cake is ready, bring it out of oven. Let it stay in cake tin for 10-15 minutes. After that rotate a knife along its edges to free them. Invert it over a plate. Pat it gently. The cake should come out clean. Remove the butter paper from the back. Place it over a wire rack to cool down. I have garnished this mango cake with white chocolate ganache and fresh mango pieces. It is totally optional and you can skip it. For preparing white chocolate ganache, I have taken 75 grams of white chocolate and 75 grams of Amul cream. You can increase or decrease the weight of chocolate and cream but remember it should always be in ratio 1:1 where both the ingredients should be equal in weight. 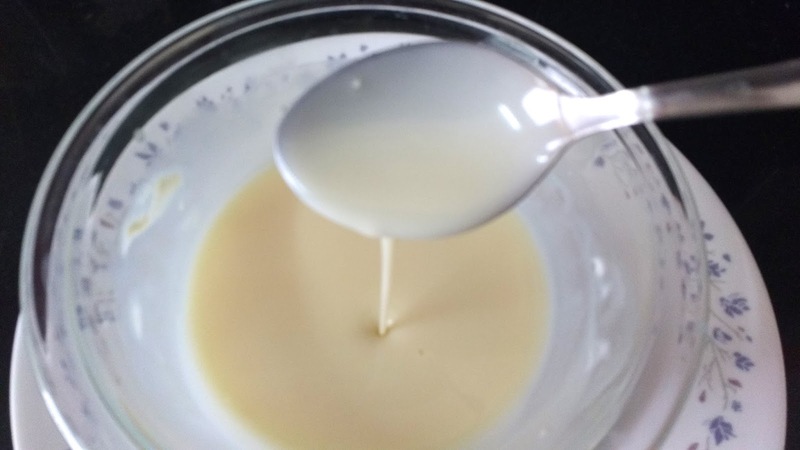 Take cream in a microwave safe bowl. 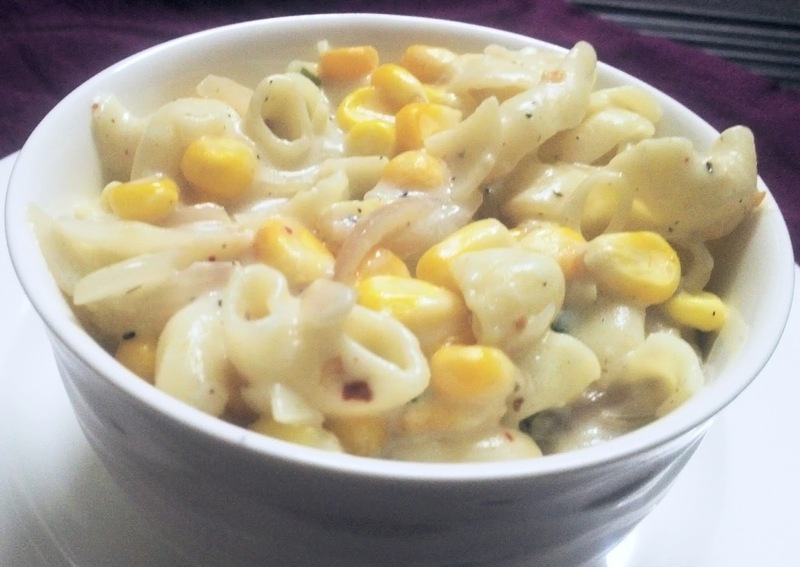 Warm it in microwave at 80 percent power for 1 minutes. Add chopped white chocolate to it. Again warm it in microwave at 80 percent power for 1 minute. Take it out and mix to form pouring consistency. If you still find the chocolate pieces in mixture, warm it on same settings for 10-20 seconds more. If you want thicker ganache you can increase the quantity of white chocolate. Let the ganache cool for 10-15 minutes. 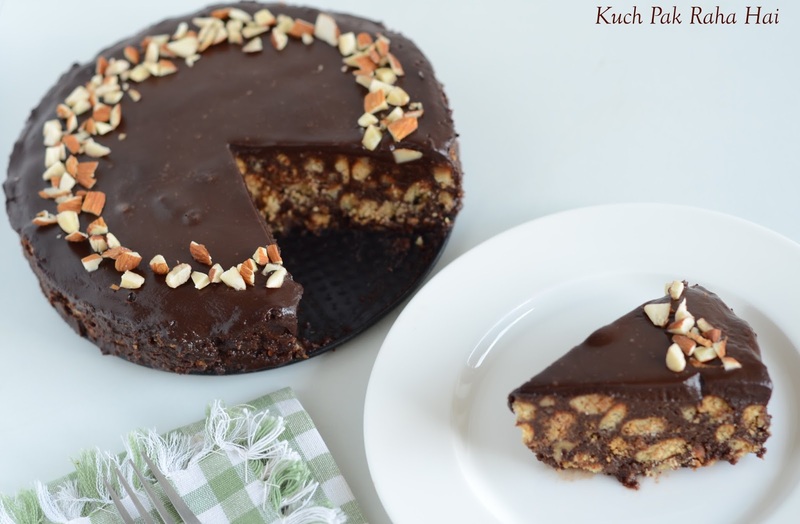 Once ganache and cake has cooled down, pour the ganache over cake. You can even spread it using a flat knife or spoon. Personally I felt this cake tastes best when chilled. 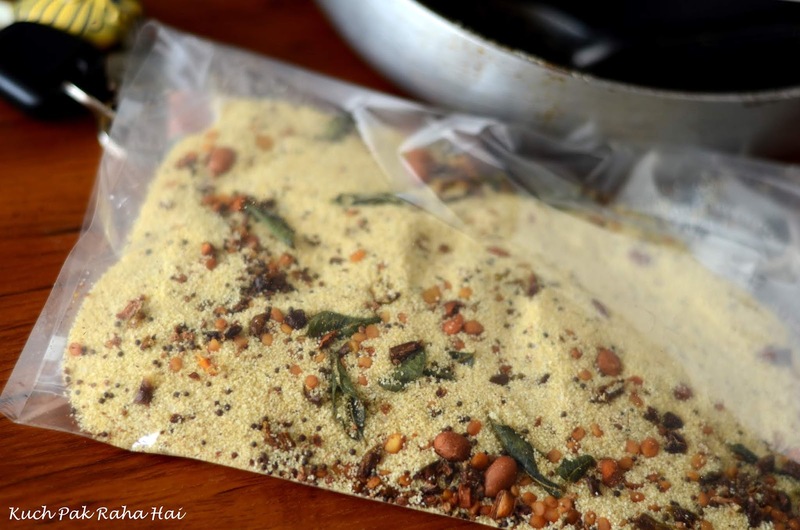 Store it in any airtight container inside fridge. 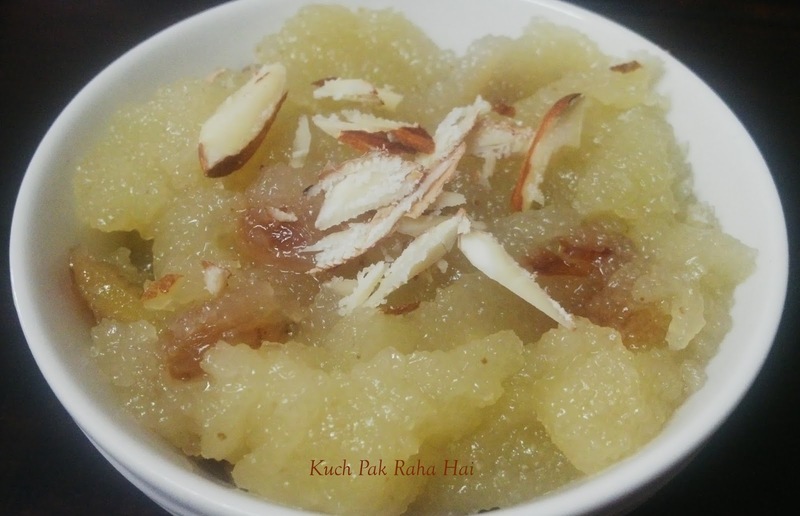 At the time of serving take it out from fridge and serve with fresh chilled mango pieces. Its tastes amazing..Trust me!! !